Learning a new language, or improving existing skills, is interesting and stimulating. Gower College Swansea offers full time A Level courses in English, Welsh, French and Spanish, from which students have progressed to universities across the UK and abroad. If you are interested in a part time course, we offer Beginners’ French, Beginners’ Spanish and various online French modules. 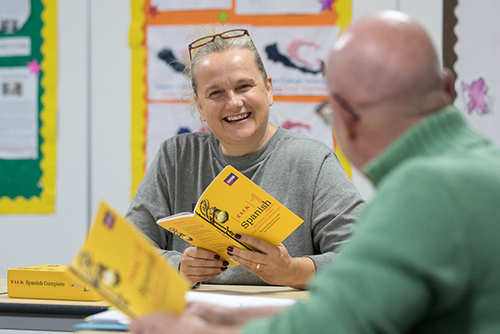 Anyone wishing to study a Welsh course should visit http://www.swansea.ac.uk/learnwelsh/. I decided to join the Beginner’s Spanish class as we own a property in Spain and I want to be able to converse better while we are on holiday. I look forward to attending every week and have met some great people in the class. I would thoroughly recommend it. "